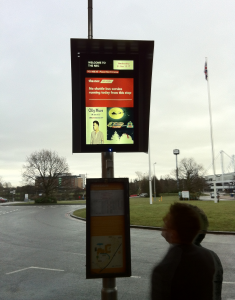 One of NEC’s digital information displays controlled by our software. The National Exhibition Centre is the largest conference and exhibition venue in the UK and one of the busiest in Europe, attracting over 2.5 million visitors each year. 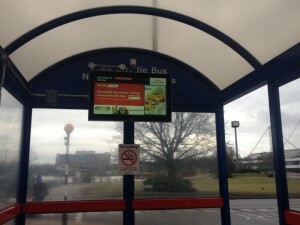 To offer an enhanced visitor experience and decrease perceived wait time, the NEC have decided to install digital information displays in bus shelters across the estate to offer customers real-time information about shuttles’ timetables, inform them about shows currently on and tell them about the other services they offer. For the control of the content and screens, the NEC Group have selected our digital signage software again, after having used it for the past six years to run the digital displays in the LG Arena. The product enables them to pull data from an external database and disseminate it to selected screens, ensuring that visitors always receive accurate, timely information that is relevant to their location. The advanced auditing capabilities demonstrate exactly when and where the content is played, offering a reliable and hassle-free communication solution. The digital information displays can be found at key locations throughout the NEC’s 610 acre site and are run by our enterprise digital signage solution- POVNG developed by our company for the past 10 years and used by major media owners such as Clear Channel and JCDecaux and other Fortune Global 500 Corporations. To find about more about this product, please visit our corporate website. Need help with more than the software? Please note that we can provide hardware, content and installation services through our partners. This entry was posted in and tagged advertising, digital signage, digital signage advertising, digital signage for hospitality, retail digital signage by Dynamax. Bookmark the permalink.